I used Model D for the first time inside NS2 and the modulation sources don’t work (lfo, osc 3, filter env and noise). Then I set all the parameters concerned to the macro knobs (modulation wheel, modulation mix, lfo rate) and I got nothing too. Then I tested Model D inside Cubasis and BM3 and it works fine. I even reinstalled it but it still doesn’t work, I have zero result when I use these parameters. Am I missing something, is it just me ? Are you saying “when you draw automation and play it back” or “just turning knobs in real-time”? I was not aware of such weird behaviour. Anyway looks like without adding modwheel to perfirmance page this has no other solution or workaround. I wrote to Matt about this. 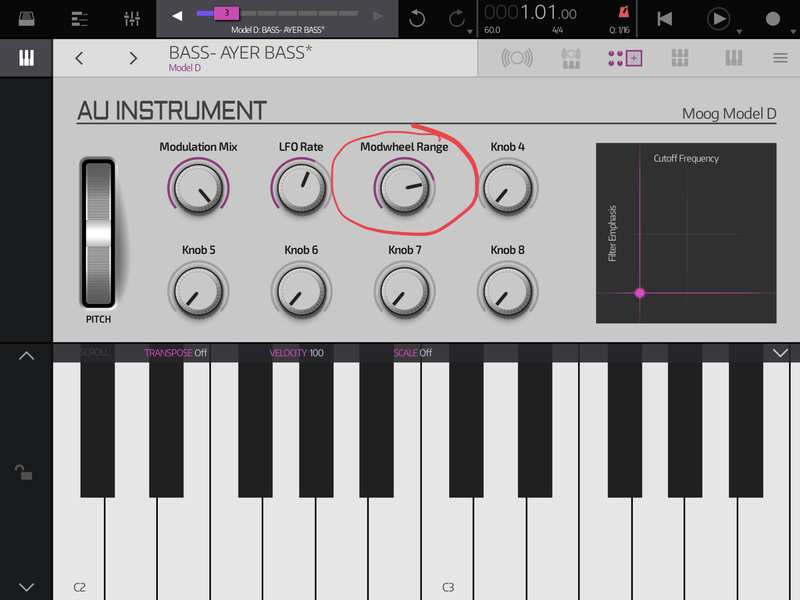 About other synths, I checked BASSalicious, which has a ModWheel that doesn’t appear on the AU version. But at the contrary of Model D, when you are in the macro menu, you can’t find the ModWheel in the parameters list. So maybe it’s because the Modulation Wheel is a function that can’t be used if it’s not meant in the host program, but this question goes way above my knowledge ! Adding a Mod Wheel to the Obsidian/AU Instrument/MIDI Instrument perf page is definitely 'on the list' at this point as it's been requested quite a bit. That said, this issue seems weird with Model D. If you can assign a macro to specific modwheel AU Param destination, it should work. I might not be understanding something specific to Model D though, tbh. Do you have AUM and Rozeta? If so, I wonder if it works to assign a Rozeta LFO to this same Model D AU Param destination (instead of MIDI CC 1) in AUM? Yes I have, I made the test and it works. Buy the way, here are 2 screenshots I forgot to attach to my first post. It shows that the ModWheel of Model D is available in the list of parameters when you are in the macro menu. That's "Modwheel range" not Modwheel itself... it doesn't work, this parameter doesn't apply modulation. That’s what I thought.... thanks for the confirmation! Hmm, now I'm even more confused. How did it work in AUM using AU Param automation then? As a not-so-awesome work around.... would it be possible to use a separate MIDI Instrument track to send CC1 to the Model D track? I'm not sure if NS supports MIDI THRU like that. Even if it works, obviously not a replacement for an actual Mod Wheel on the AU instrument itself but should at least allow for basic operation. 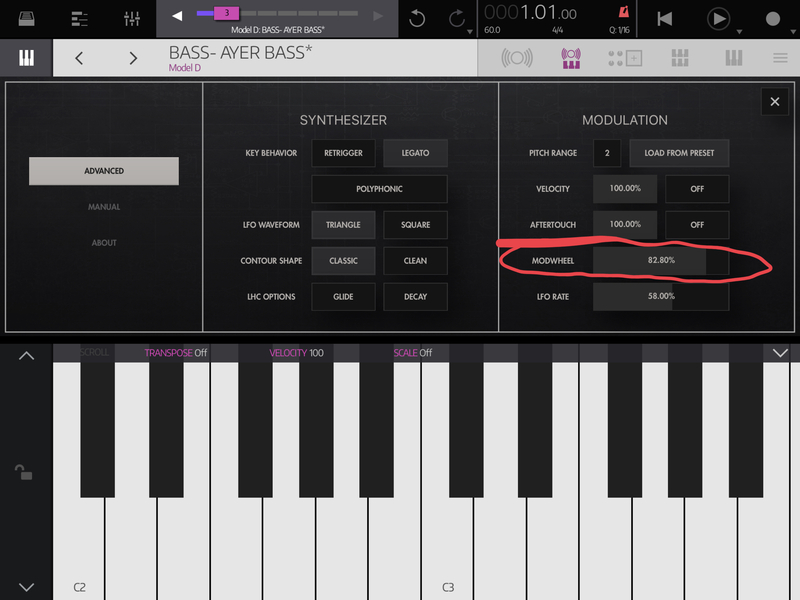 It's weird that Moog wouldn't make this available via AU Params since it's such an essential part of the app's sound/engine. I just gave it another try because this thing was bothering me. I was sure I heard the modulation worked the first time I use Model D inside NS2. So I launched Model D and used a preset with the modulation already on (whichever this one was). And after I set the parameter called “ModWheel range” (the word “range” can be confusing) to a Macro knob, this one behaved like a regular modulation wheel, from 0 modulation to 100%. And it does correspond to the Modulation wheel setting which can only be accessed in the setting menu of Model D.
So I don’t understand why it didn’t work last time, I struggled with it hard enough to conclude that it was an issue coming from NS2 and the lack of modulation wheel in Obsidian. @Cyril Wait, you are trying to say that "ModWheel range" actually DOES it's job and applies modulation ?? Now i'm super confused - it does not work for me. "Modwheel Range" actually just changes % of applying modwheel to modulation amout, which can be set in Model D "settings" page uner "Modulation" tab ... there is "modwheel" option with percentage values from 0 to 100% - this is exactly what you control with "modwheel range" ..
@Cyril That's great news. I started to mess with this very path but got distracted. Settings ModWheel: 100% + Range: 0 == No modulation. Settings ModWheel: 100% + Range: 100% == 100% modulation. Settings ModWheel: 100% + Range: 50% == 50% modulation. Settings ModWheel: 50% + Range: 100% == 50% modulation. Settings ModWheel: 50% + Range: 50% == 25% modulation. @Will Yes i understand how modwheel range works... but still it doesn't apply modulation if you use it inside NS because you cannot send modwheel value itself... So inside NS2 modwheel value is still 0. Still haven't tried it but was under the impression that the ModWheel slider in Settings set a base value for the mod wheel itself. No, mod wheel slider in settings == mod wheel range AU param... even if you map MW range to macro, tweak it andvtben you go to settings, you see that slider value is changed..
I’m pretty sure that it’s not possible to send midi CC’s to an AU. They get blocked. The only way to control AU instrument parameters seems to be via assigning the 10 macro knobs. Ah. I think the modwheel value is saved with the patch. If so, for patches with some amount of modwheel pre-applied, range would appear to work.